So many people told me to read Illuminae by Amie Kaufman and Jay Kristoff and I should have listened to them earlier. This novel may be six hundred pages long but it sure didn’t feel that way. I couldn’t put it down, which may have been due to the format of the novel which is far out of the ordinary. The story is told through transcripts and digital messages between characters along with the AI’s inner thoughts and processes, and each section numbers no more than ten pages meaning it is so easy to keep reading. Illuminae is the tale of a girl called Kady and a boy called Ezra, and a hectic rush to escape from death. Kady and Ezra along with another ten thousand or so people, are on the run from a ship that tried to destroy them. They might make it to safety, or they might not. Their ship is extremely damaged and the other ship is closing in. There is conspiracy and confusion, a space plague and a battle. But at the heart of it all is the relationship between Kady and Ezra, after all they are two teenagers with a very complicated past. I could not put this book down, I read it in two days. In a world of repetitive ideas, this seemed fresh. I’m not saying that there weren’t cliches but they were done in a way that was still exciting. The pacing was amazing and the tone might not have been what I expected but it fitted the story so well. I loved the setting of this novel. The ship wasn’t just the backdrop of the series, it was an important part of it. I always do love novels where there are limited resources or a confined environment because it means sometimes there is truly nothing you can do to save yourself which is something that I am really scared of. The characters were pretty awesome and although there were a lot of them and I did sometimes get them confused they each had distinct styles. I loved AIDAN and Ezra, Kady sometimes got on my nerve but she was a very strong character and I could appreciate that. However where this series really shone was in the plot. It just kept going, I never got bored. I found some elements of the plot to be a bit gruesome and considering I was reading late at night I was thinking about it for sure but it was valid in the context. I am kind of worried that they have set up this whole disease and then eliminated it, I hope that they explore it further because I was really interested. 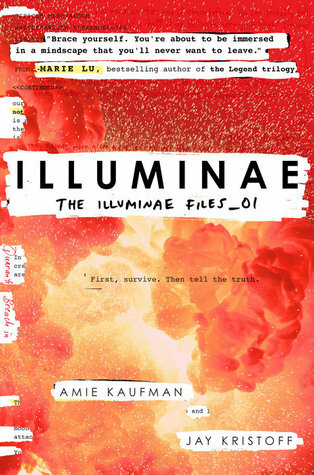 I am giving Illuminae five out of five stars, and honestly I think that in a few years it will be a staple of the genre. I loved everything about this book and although the format may have led to me being a bit less connected to the characters I can see why they did it, for the mystery. You never truly know who is going to live and who is going to die because the characters don’t have to be alive to tell the story. I am really looking forward to getting my hands on the sequel when it releases in October. I’m reading this book right now and so far it’s amazing! If anything, I feel like the format of the book brings me closer to the characters instead of further, like I’m experiencing it myself through their chats and documents and so forth. There were some buts when I felt that way but there were also some when I didn’t really relate to the characters due to the format.